When USB audio interfaces first came along in 1996, it drastically changed things for the better for people recording at home or on a tight budget. 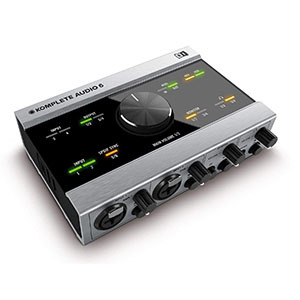 With a high quality USB interface, you can get professional-quality audio without paying what the pros pay. It truly is the most affordable way to make music that can compete with the industry standards– you can get your song radio ready just like the music stars. And what artists can turn down that potential? One of the best looking USB interfaces on the market. Comes packed with a great set of preamps. Packed full of awesome features and tools. Standard Fender build quality, detailing and finish. 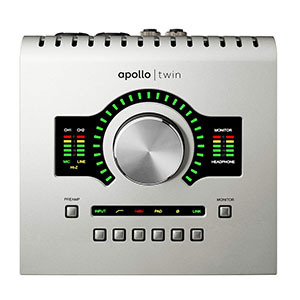 Compared to most other USB interfaces, Universal Audio Apollo Twin comes across as pretty refined. This brand understands that function should always come over form but that it is best if you can do well in both of these areas. Because of that, Apollo Twin is easily among the best looking audio interfaces on the market at this very moment. When it comes to specs, you are looking at 2 analog inputs and 6 outputs. The built in mic preamps are pretty impressive all things considered, and offer great tone no matter what kind of setup you are running. Thanks to the USB 3.0 interface, you can expect to hit high resolution of audio with ease and low latency. One of the best looking compact 2 channel interfaces. Packs a great array of features and options. Comes with an easy to use control layout. Low latency and high audio quality sound makes it functional. It is a fingerprint magnet to say the least. Being one of the giants of audio software and hardware, Native Instruments naturally offers one of the best USB interfaces on the market. We are talking about the Native Instruments Komplete Audio 6 and it is quite awesome. Aside from its numerous features, this interface looks pretty great and fits quite nicely in a modern studio setting. There’s more, though. Native Instruments went with a pretty standard layout which has been used by multiple brands. However, aside from the front and rear panel, Komplete Audio 6 also offers a top control panel which allows you to track the status of what’s engaged and adjust gain. What defines this interface are its awesome preamps which really deliver good audio all around. A no nonsense setup that is easy to use. Comes with two awesome mic preamps. Features low latency, high resolution audio. Great bang for the buck value right now. Isn't all that interesting in terms of looks. Steinberg’s hardware usually represents a great combo of price and performance. That also applies to their audio interfaces. 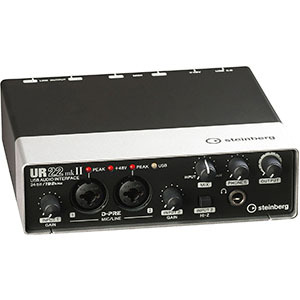 Steinberg UR22MKII may not be the most amazing interface on the market, but it sure packs a whole lot of heat for the price. This is a no nonsense package that has been proven to work and deliver day in, day out. What we have here is a 24-bit/192 kHz setup which pushes a low latency signal using a USB 2.0 standard. 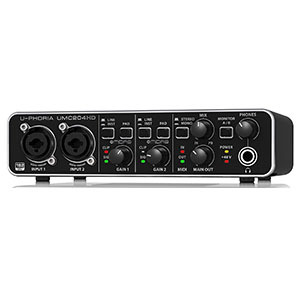 It comes with two mic preamps of good quality, which offer great audio no matter what kind of mid you are running. Overall, it is a rock solid choice for beginners as well as the more advanced users. Great aluminum chassis which really inspires confidence. Features a set of really great mic preamps. Comes with a set of features and controls you'd expect. Great audio quality all around. Not much to look at but that doesn't really matter. 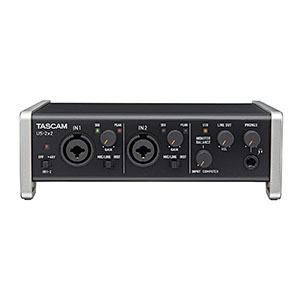 Tascam’s US-2×2 is one of the best entry level audio interfaces you can find at the moment. This is a dual channel rig which offers everything you would expect in this category. However, the rock solid internals make a bit special compared to most of its direct competition. If you are after a simple but efficient interface, this is it. When it comes to specs, Tascam US-2×2 offers two awesome mic preamps. Both channels are capable of running both microphones or instruments, and feature dedicated gain knobs. Overall, the sound you are getting is punching above its weight class for sure. It’s a great choice for beginners who need something simple, but also more advanced users who on a budget. One of the better looking entry level interfaces. Great set of features for this price range. 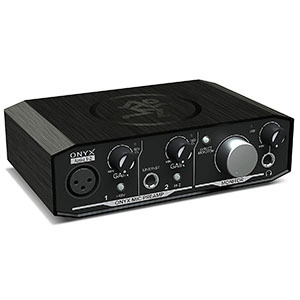 Comes with a great mic preamps and plenty of features. Great for beginners who are getting used to recording music. A single mic preamp is a bit limiting. Mackie is a brand that is best known for their entry level monitor speakers. However, they have since branched out into various different gear, including audio interfaces. Mackie Onyx Artist 1-2 2×2 is an awesome little package that really brings the proven Mackie quality we are used to seeing. At this price, it’s one of the best options out there. It comes in an awesome looking chassis and features two channels. One thing to note is that this model comes with a single mic preamp that runs through a dedicated mic channel. The other channel is a dedicated instrument channel and can’t be used for mics. Overall, the quality is pretty great especially considering high resolution 24-bit/192 kHz audio. One of the most proven and oldest designs out there. Comes with great electronics and hardware. Great looks with its iconic red chassis. Awesome audio quality all things considered. Single mic preamp is a bit limiting. 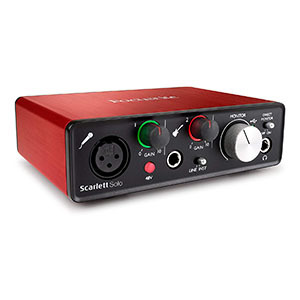 Focusrite Scarlett Solo has got to be one of the most iconic audio interfaces on the market. This is the model that many used to start recording music. Over the years, it has been ironed out to a point where you get a very tight package. If we had to choose one interface to recommend to beginners, this is it. As you can probably gather from its name, this particular interface packs a single mic preamp. However, it is a standard dual channel rig which means that one of the channels is a dedicated mic channel while the other is a dedicated instrument channel. The audio quality is great and you can count on high resolution audio no matter what. A very unique design which is pretty attractive. Great selection of hardware for such an affordable rig. Comes with awesome selection of software. Delivers good audio quality no matter how you use it. Unusual design which requires some getting used to. M-Audio is known for doing things their way from time to time. 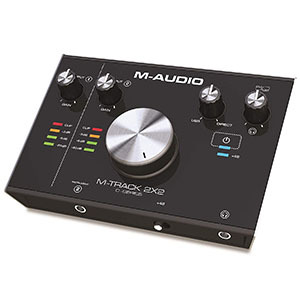 Where most other brands are using a standardized interface design, M-Audio went with something completely different. This is great in a sense that you are getting a unique package, but it does take time to figure out. Its quirky design aside, M-Audio M-Track 2X2 C-Series is quite awesome. This model features two channels with dual inputs and dual outputs. The audio quality you can count on getting is 24-bit/192 kHz, which puts it up there with the rest of the segment. The preamp is pretty great, especially if you’re using condensers. On top of all that, it comes with an awesome software support that makes things easy. A simple and straight forward interface. Great bang for the buck overall. Comes with two preamps which is pretty rare. Offers decent audio quality with low latency. The control panel takes some getting used to. Another brand that has built a strong following thanks to their audio interfaces is PreSonus. Although they are known for all kinds of audio gear, most casual users have heard of them through their AudioBox interfaces. 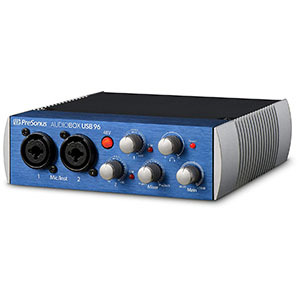 The PreSonus AudioBox USB 96 2×2 we are looking at today is an ironed out version of the original AudioBox and offers much more. It comes with two mic preamps, two inputs and two outputs. The control interface isn’t as intuitive as some other on the market, but it is easy to get used to. The overall audio quality is very decent although you are maxed out with 24-bit/96 kHz sampling rates. At this price, it’s a very decent package all things considered. One of the best bang for the buck values. Great design which is easy to use and functional. Packs two pretty awesome MIDAS preamps. A decent looking chassis that fits in anywhere. The software it comes with isn't all that great. If there is a brand out there which is capable of designing and shipping affordable audio gear that works, it is Behringer. Their products are driving many amateur and semi professional studios around the world. Behringer U-PHORIA UMC204HD represents their take on a dual channel audio interface. Compared to its direct competition, this interface is packed full with great features. You are looking at two MIDAS designed mic preamps which are truly awesome. The sound quality they deliver is worthy of respect. Each channel comes with its own gain control and attenuation pads. On top of that, monitoring features allow you to tap into zero latency monitoring of your signal. Overall it is really a bundle that keeps on giving. USB audio interfaces are usually the simplest devices out there, and that’s great news whether you’re a novice, and intermediate-level engineer, or a professional who just likes to keep things simple. One reason these types of interfaces are so simple is because they have exactly the feartures you need to record and not much more than that. Most USB interface models can pull power from the computer, meaning you don’t need to have an extra outlet to power the interface. This can be especially nice for recording off-site or on the go. USB technology has come a long way from the original, now offering USB 3 — it has only gotten better with each upgrade, so that means it may continue to get better. Because USB audio interfaces are so simple and usually have just the basics, that makes them extremely easy to use. When I first started recording, I used a USB audio interface — it was made of cheap plastic and had only one XLR/quarter-inch input, but it got the job done, helping me record an entire EP. And I spent well under $200 for the device. And now, nearly 10 years later, I’ve upgraded to a Focusrite Scarlett 2i2, which is a USB interface with two XLR/quarter-inch inputs. It, too, does a fantastic job for recording on my own. Nothing fancy, just a reliable little interface. Likewise, even some pro engineers decide to go with USB interfaces because of their ease of use. If something’s good enough for the pros, it’s probably good enough for DIY artists. In this case, that is the truth. USB audio interfaces are simple, easy to use, powerful, and — lastly but not leastly — very affordable. USB interfaces are some of the most affordable devices on the market, and that’s a big draw for a lot of DIYers recording at home. Typically, you can find a decent USB interface for under $300. Compare this to a the audio interfaces that use Thunderbolt, which are in the $500-600 price range, or those that use Firewire, which are in the $300-400 price range. Granted, the more you’re willing to pay, the more features and potentially better quality you might get. But if you’re budget is on the lower end, getting a USB audio interface is the way to go. Are you looking to keep things simple? Think USB. Do you want an audio interface that has exactly what you need with not a bunch of extra, confusing features? Think USB. Are you trying to stay within your DIY budget? Think USB. You get the point. If you answered “yes” to any, some, or all of those questions, then a USB audio interface should be in your recording studio. They can be a simple, affordable, and reliable addition to your recording studio setup.